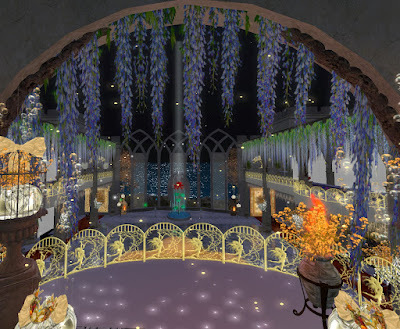 When you go to Avilion, you will arrive in this medieval fantasy community at the SIM landing pad. As the world rezzes quickly around you, the music playing invokes images of romance with the smooth vocal selections. The love and romance songs playing are well selected, think Barry White. 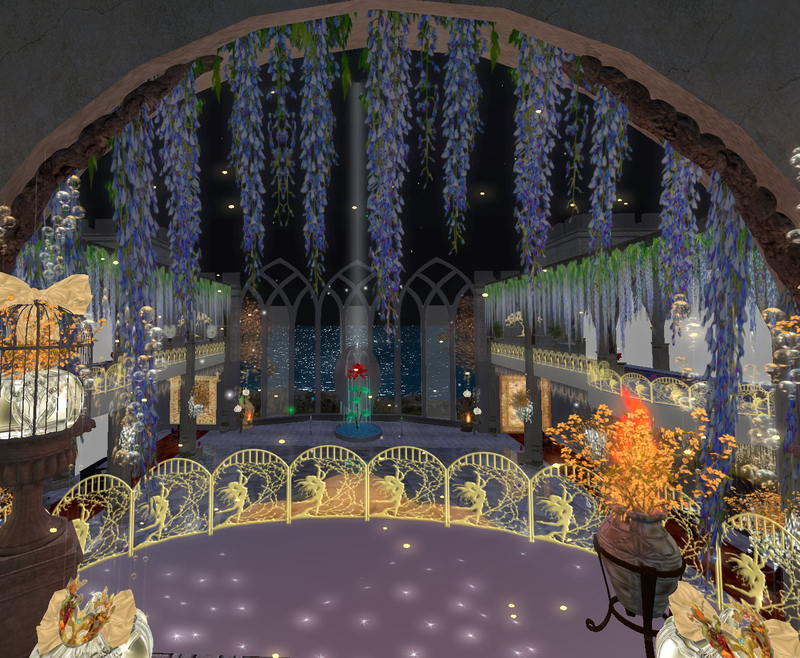 To reach the ballroom you click on the ornamental scepter and are teleported to the foot of the grand staircase to the front entry. On your way up the staircase, there are poseballs for a nice couples picture. I recommend taking a moment to make a snapshot of the evening. As you cross the front entry at the top of the stairs you are treated to a view that can best be described at magical. Your eyes will sweep the reflective polished ballroom floor across to the large rose at the end of the room. Behind the rose the water is sparkling in the midnight light, the sky above you is carpeted with stars. There are several slow dance and ball room dance pose balls. My personal favorite is Slowdance v7, but do try them all. In the pictures I have tried to capture some of the poses. The real magic in this location is that even though you are immersed in a grand and a beautiful room, when you look at your date you will realize that she or he is the true beauty in this room. This place brings about romantic feelings such as that and more and you experience it. The Rose Theater Ballroom is a well known and well loved location. 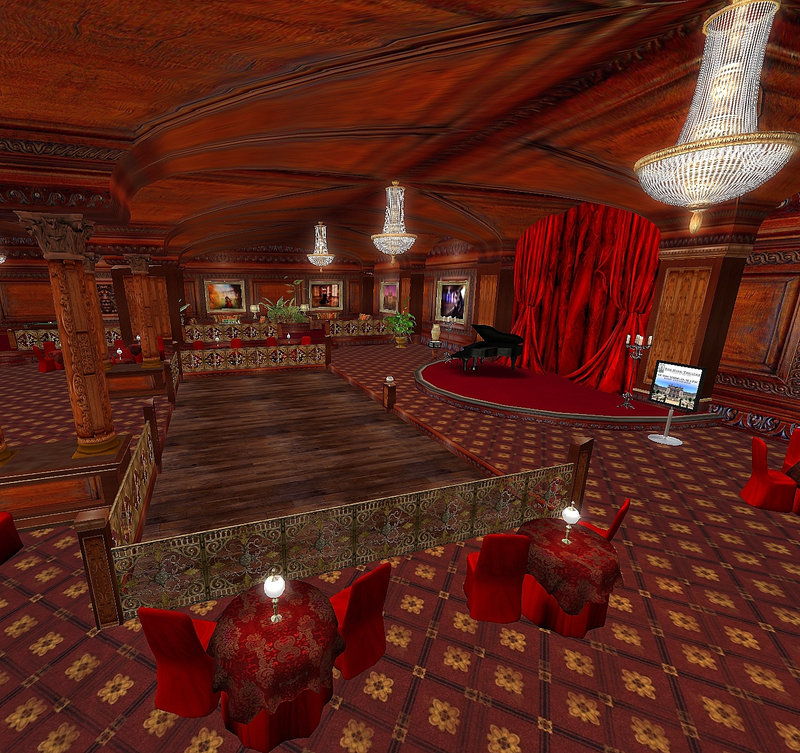 Part of the cultural hub, Angel Manor, you can be treated to many forms of art here both 2D and performance arts. Along with the Theatre, there are galleries, an opera house, a chapel and other activities. For your first date you will want to go to the ballroom. Walk with your date up the staircase into the marble foyer. Turn left and walk towards the Rose Bar inside another set of doors. Once inside you will see an intimate oak hard wood floor to your left. Scattered throughout the room are romantic intimate tables for two. Individual tables have lamps and are topped with rich red table cloths. It is easy to sit at the welcoming tables which offer many sit positions. Having sit options is a great way to convey mood. This is an easy place to move to the dance floor with a date. The dance ball for couples has numerous options. There are four main options [General, Ballroom, Romance, Love] and within each of these are a variety of dances to choose from to dance. If you want to cozy up quickly, I recommend ‘romance’ and ‘two hearts’. The next two locations on the top 5 list are locations to explore. Both are casual dress Moderate SIMS. The landing point at this SIM is a great focal point for the activities. You land a short walk from the chapel on one side and a lake on the other side. This SIM is built and maintained by Daisy Kwon. She is always making changes for the season and in other ways to make it more romantic. If you join the group, you may rez props for your pictures. A notecard is given to you upon arriving with all the information. I was invited to this SIM some time ago and my first landing was in the ruins at the top of the hill. This SIM has romantic spots situated around a beautiful lake. At the ruins, sunset or midnight lighting, you can see the most beautiful lighting. The dances are some seriously close dances, so might not be your first stop here. I recommend visiting the general store Lakeside . Go inside and you will see where people put up their happy pictures of visits here. Along side of the Lakeside general store are rezzing bikes. The best way to explore this SIM is to go around the lake. Taking a bike ride is a great way to get into a relaxed feeling on a date. Keep in mind for later in the date, there is a superb cappuccino machine on the dock below the store. Feel free to explore all the areas, including the deserted cabin because all animations are PG, so if you try something out you will not be embarrassed. Experiment with the sun settings, I found different settings favored different locations. This SL long running classic has shopping and a park on your walk to the club. Dress is cocktail to formal. You land down the block from the club and walk up to the dramatic facade of the building. 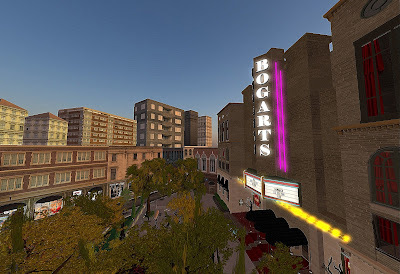 The marquee proudly proclaims “Romance is in the Air” and it most certainly is in Bogarts. Walking inside the first set of doors, scheduled activities are listed to your left by the elevator. Going further inside to the main room it has the feeling of an elegant theatre with high ceilings and a stage with ornate golden trim at one side. The color scheme is rich reds and golds throughout. You will be greeted as “Mr.” or “Ms.” by what I feel are the best hosts and hostesses in SL. They make you feel welcome and also have that breezy air about that may be best described as elegant fun. The DJs are equally top notch. Requests are played quickly and as a dedication or a request. Imagine requesting a romantic Norah Jones song and dancing with your date. There are snacks near the entrance and of course drinks at the bar. Around the dance floor are cozy tables where you may easily have a conversation while listening to some great music. A note for those wishing for a first date; Bogarts is a good place to meet people. Whether to just dance or to make a new friend, those who go to Bogarts are friendly and most are regulars.